See how text, graphics, images relay to AFP objects like TRNs, BGRs and BIMs. AFPWorX validates your AFP structure against the MOD:CA specification. 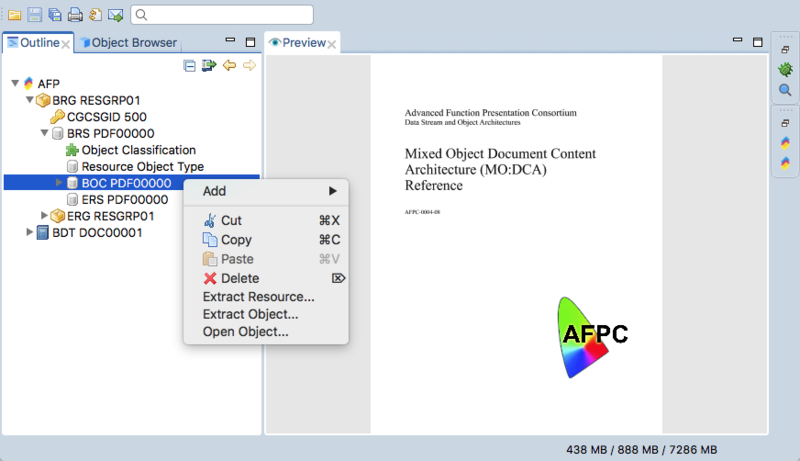 AFPWorX is an analyzing tool for your AFP (Advanced Function Presentation) data. Perfect for understanding the building blocks of your print streams, mastering printing challenges and performing last minute changes - even to very large production files. AFPWorX supports all current MO:DCA, GOCA, BCOCA, FOCA, IOCA and PTOCA specification. 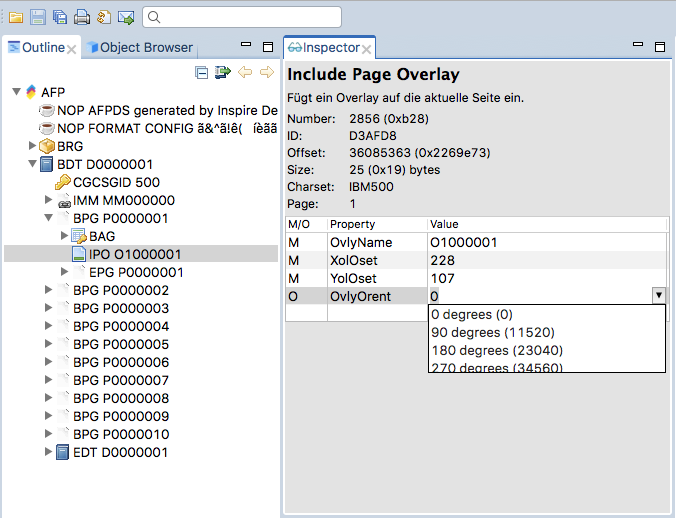 Displays all AFP Files, including PDF Object Container. 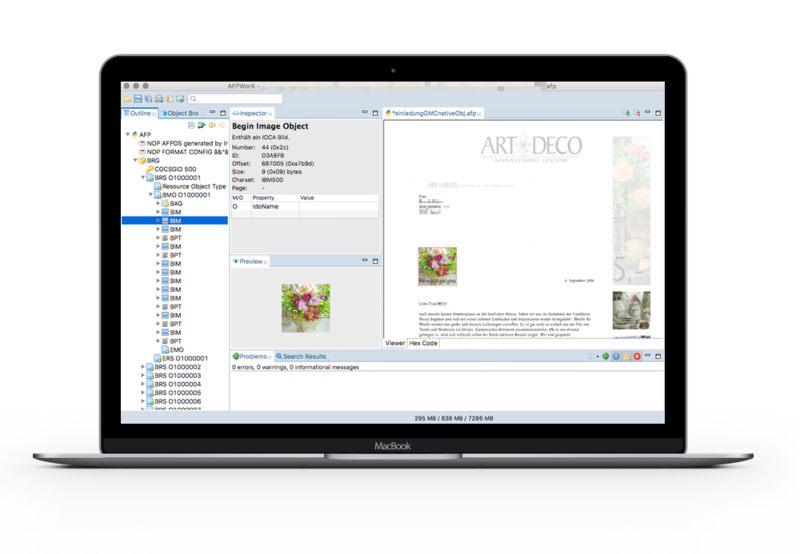 Even large production files are opened in seconds. Designed to put you back into the AFP driver seat. Using AFPWorX you will see all structured fields, triplets, self defining fields, GOCA commands, ... that build an AFP file. An easy to use tree structure guides you through your data - while explaining the meaning of those fields as well as allowing you to modify any value. AFPWorX comes with an integrated viewer that understands how a structured field is represented on a page and allows you to select fields by just clicking at them. So you can find e.g. the BIM that creates an image very fast. AFPWorX validates your AFP structure against the MO:DCA specification. 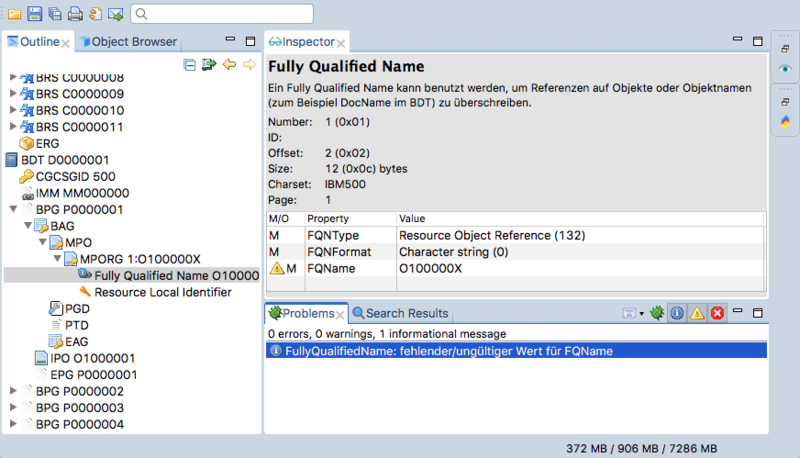 Any violation is shown and highlighted in the structured tree viewer. Inspect the error and make the appropriate correction. If possible AFPWorX offers an automated fix to problems. While editing structured fields AFPWorX shows the possible values for attributes as well as allowed structured fields in envelopes - assisting you in getting your data right. You need to use a certain font, codepage, image, … in another file? - Simply copy &amp; paste it. Or you extract it as an AFP resource to your local harddisk. - For object containers (e.g. TrueType Fonts or PDF) AFPWorX can also store it in their native (.ttf, .pdf) form. Open over 100.000 pages in under 10 seconds!